As Principal Deputy Assistant Secretary for Fossil Energy, Dr. Der will be responsible for office operations and, in support of the Assistant Secretary, he will manage the oversight of Fossil Energy’s Research and Development program and the U.S. Petroleum Reserves. demonstration programs, including the Clean Coal Technology Demonstration program; the Power Plant Improvement Initiative; Clean Coal Power Initiative; and FutureGen – a demonstration program for near-zero emissions coal, including carbon emissions. Dr. Der has worked at DOE for 35 years in various programs. He entered government service as a reactor intern in the predecessor agencies to DOE, starting with Atomic Energy Commission. He worked as a structural and materials engineer in nuclear reactor plant designs of the Fast Flux Test Facility and the Clinch River Breeder Reactor Demonstration during the Energy Research and Development Administration. 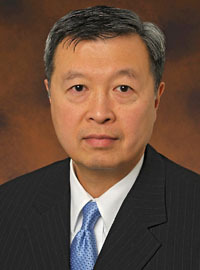 Following this, he managed research in the civilian radioactive waste management program on geologic storage of high-level nuclear waste; research on superconductivity in the Office of Science's (formerly the Office of Energy Research) magnetic fusion energy program; and research in Fossil Energy’s advanced coal and gas based power systems program. His prior work includes NASA's Apollo 15 moon mission project and the National Oceanic and Atmospheric Administration program on modeling the upper atmospheric density. Dr. Der holds a Bachelor of Science, a Master of Science and a Ph. D. in Mechanical Engineering from the University of Maryland. He is married, has two daughters and resides in Gaithersburg, Maryland.